The Large Hadron Collider, the Relativistic Heavy Ion Collider at Brookhaven, PEP-II at the Stanford Linear Accelerator Center (SLAC), the positron damping ring of the proposed International Linear Collider — these and other present and future machines depend on accelerating protons, heavy ions, or positrons to high energies and high currents. But accelerating positively charged particles can cause the formation of negatively charged electron "clouds" in the beam pipe, which can interfere with their motion and severely dilute the intensity of a positive-particle beam. As accelerators grow more powerful, the need for accurate measures of electron clouds — their density and where they are in the beam pipe — becomes more important to accelerator performance. 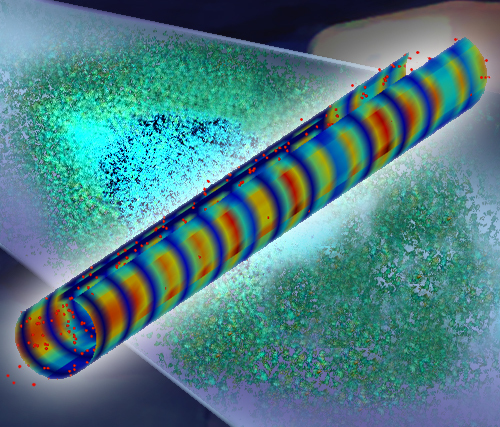 "The existing system for measuring electron clouds is to use electron traps, positive electrodes inserted into the beam pipe that attract nearby electrons," says John Byrd of Berkeley Lab's Accelerator and Fusion Research Division (AFRD). "For practical reasons, mainly lack of space, you can't squeeze in many of these, and space will become tighter as accelerators become crowded with bigger magnets and other equipment." Electron cloud density can vary significantly along the beam pipe. "An electron trap is local," Byrd says. "It only detects the electrons reaching it at a particular place on the wall of the pipe and can't give adequate information about the overall characteristics of the beam over a long stretch of the pipe." At the positron ring of SLAC's PEP-II collider, Stefano De Santis, Byrd, and Kiran Sonnad of AFRD, working with Fritz Caspers and Tom Kroyer of the European Center for Nuclear Research (CERN) and Anatoly Krasnykh and Mauro Pivi of SLAC, have demonstrated a novel technique called "microwave dispersion," which employs microwave signals to directly measure electron-cloud density over long lengths of beam pipe. When a charged particle changes direction, as when negotiating the curves of an accelerator ring, it emits "light," electromagnetic radiation known as synchrotron radiation. This can be a significant drain on the energy of beams of particles like electrons or positrons, which have little mass, but with positron beams the production of electron clouds is an even worse problem. The primary emission of particles begins when synchrotron radiation knocks electrons out of the metal walls of the beam pipe, or when stray beam particles hit the walls or ionize atoms of background gas in the pipe. The electrons quickly multiply through secondary emission. As the positive beam particles pull the electrons to higher energies, the electrons are driven into the walls and knock off still more electrons,forming dense clouds that interfere with the beam and degrade the vacuum in the pipe. The test equipment sent a microwave signal from one beam-monitoring antenna to another 50 meters away. The density of the electron cloud (blue) falls off sharply in the gaps between the positron bunches in the beam (red); the modulation of the microwave signal introduced by these bunches can be detected at the receiver once the strong signal of the beam itself has been subtracted by self cancellation and filtering of unwanted frequencies. The density of the electron clouds is affected by whether or not a magnetic field is applied using the clearing solenoid. "The electron clouds are a plasma, and like other media such as air or glass, a plasma has an index of refraction; the speed of light passing through it varies from the speed of light in a vacuum, depending on its density," says Stefano De Santis. "We decided to determine the density of the electron plasma in the pipe by seeing how much it slowed down a microwave signal — how much the phase of the signal was shifted." Measuring the absolute phase delay of a microwave signal passing through electron clouds in a beam pipe isn't practical, however, since over distances of a few scores or hundreds of meters the shift is negligible. 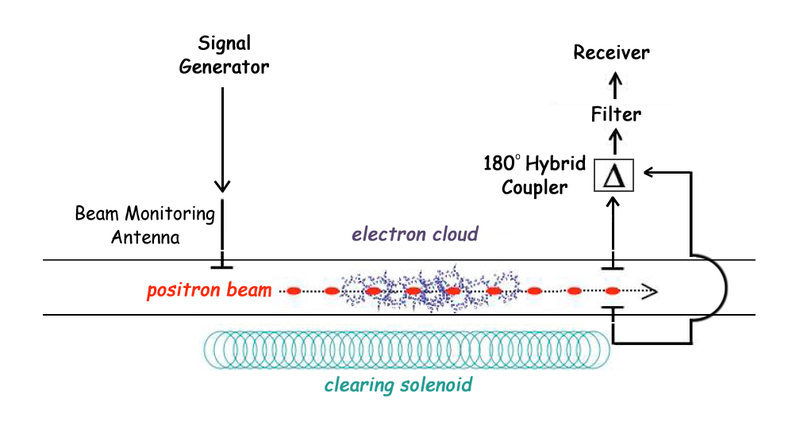 "The accelerator beam is a series of periodic pulses," says Kiran Sonnad, "which may lead to a resonance condition, known as 'multipactoring,' resulting in the creation of an even higher-density electron cloud. But the gaps between the pulses cause a periodic clearing of the electron cloud, and we took advantage of this fact." The PEP-II ring used in the research, 2.2 kilometers in circumference, circulates 1,700 bunches of positrons 136,000 times a second (136 kHz); the gaps between the bunches last only 100 nanoseconds (billionths of a second), during which time the electron cloud density falls off sharply. "Instead of measuring the phase lag of the microwave signal, we measured the modulation of the phase caused by these gaps," says De Santis, "which is a much stronger signal." Although the phase modulation due to the 100-nanosecond gaps in the beam is greater than the absolute phase delay, the signal is not strong compared to the signal from the positron beam itself, which is particularly strong at frequencies corresponding to the harmonics of the ring circulation rate and the bunch repetition rate, 238 million times a second (238 MHz). They had to find a way to optimize the phase shift caused by variations in the electron cloud density while transmitting a signal strong enough to be detected over the much stronger signal from the positron beam — especially avoiding 136 kHz and 238 MHz and their harmonics, and other characteristic frequencies in the spectrum of the positron beam signal. Says Sonnad, "We showed that theoretically, the phase modulation signal could be greatly amplified by using a microwave frequency that is close to, but above, the cutoff frequency of the beam pipe" — a frequency determined by the dimensions of the pipe acting as a wave guide. At the same time, however, "the transmission strength of the microwave signal is severely reduced as one approaches the cutoff frequency," Sonnad says, so they had to carefully scan through a range of frequencies to find the optimum. To perform their experiment, the researchers chose a straight section of the ring 50 meters long, already equipped with antennas whose purpose was to monitor the positron beam. They transmitted a microwave signal between these antennas at the chosen frequency and further subtracted the unwanted signal by using filters to eliminate it at frequencies beyond the range of interest, and by fitting the receiving end of the microwave system with a "180-degree hybrid coupler," which eliminates unwanted signal frequencies by mixing them with themselves, 180 degrees out of phase. The electron-cloud-induced phase shift was evident in the microwave signal received after its passage through the beam pipe, and from it the researchers were able to estimate the average density of the electron clouds through the pipe section. The phase shift was dramatically more evident when the researchers turned off a device used to suppress the formation of electron clouds. This solenoid, a series of wire wrappings around the pipe, creates a magnetic field inside the pipe and attracts electrons to the metal walls. Thus the researchers were able to use their microwave dispersion technique to measure variations in the electron cloud density by varying the magnetic field. Although challenges remain — for example, the microwave dispersion technique has yet to be tested in strong magnetic fields, and piggybacking on beam-monitoring antennas will be more difficult in accelerator rings without straight sections — the technique devised by De Santis, Byrd, Sonnad and their colleagues is already a major step forward in measuring electron clouds and assessing possible methods of controlling them. The ability to reduce electron-cloud interference is of primary importance, especially for positive-particle accelerators still in the design stage. SLAC's Mario Pivi, who collaborated in the microwave dispersion research, estimates that curing the electron cloud problem for the positron damping ring (pre-accelerator) of the proposed International Linear Collider could affect its architecture and dimensions and save "hundreds of millions of dollars." "Measurement of electron clouds in large accelerators by microwave dispersion," by Stefano De Santis, John Byrd, Fritz Caspers, Anatoly Krasnykh, Tom Kroyer, Mauro Pivi, and Kiran Sonnad, appeared in the March 7, 2008 issue of Physical Review Letters and is available online to subscribers. More about electron clouds and the International Linear Collider is in "Battling the Clouds," by Erik Vance, in the June/July, 2006 issue of symmetry.